Shopping Campaigns and Small Business | Anvil Media, Inc. This is an astonishing amount of budget, but I have a couple reasons as to why and how small businesses can still capitalize on shopping campaigns and remain competitive on text ads. First of all, it makes sense that the retailers the study refers to, like Amazon and Walmart, would want to spend more money on shopping campaigns versus text ads. With these retailers carrying thousands of products, it takes much less work to keep a robust product feed working correctly. The only requirement is upfront on the content writers to have keyword rich descriptions for all the products, which is already done before the marketing happens. Then, the web developers create a feed that meets the correct standards, which is an overall project and not down to the specific product. This is a much cheaper and easier task than having a large, search team pick and choose products and build a strategy driven, quality, text-ad search campaigns. This would be the main reason why a large retailer with a large, multi-category product list would move more budgets into the shopping network versus trying to show ads for search terms that run the gamut of variations. The second reason for small businesses to not feel discouraged by this is the shopping network ranks and shows products a lot differently than search ads. 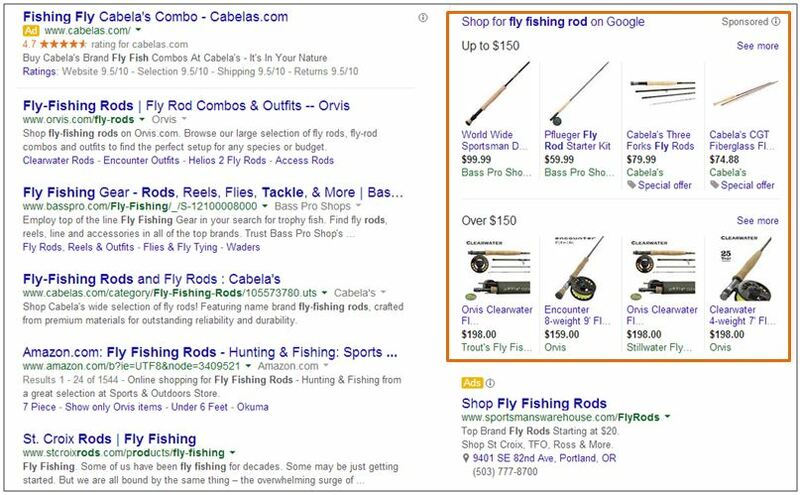 Shopping ads take up the entire right side of the search page with roughly eight products visible. Bids work just like search and can accommodate your budget, which can also be set by the advertiser. Shopping campaigns also give you benchmark click through rates to show how similar items are performing to help you optimize your campaign. With everything that Google is putting into the shopping tools, having quality descriptions and an optimized product feed can be all you need to beat out the biggest spenders. You may not show up as much as an Amazon, but you can claim a stake in the shopping space. For search ads, keep your keywords narrowed and focused on top sellers and highest ROI products to stay competitive in a highly competitive vertical. This will help grow your budget over time and keep budget focused on the best performing areas with higher bids. So, with the right strategy in place, any small business can compete with the giants of eCommerce.